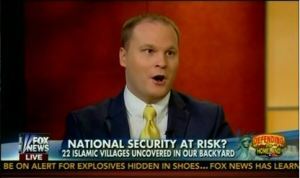 Fox News has repeatedly hosted members of the fringe group Clarion Project, an anti-Muslim organization known for spreading Islamophobic fears, to discuss serious national security matters. On February 20, Fox News hosted Ryan Mauro, a national security analyst from the Clarion Project, also known as the Clarion Fund, to discuss possible security threats on airlines. Mauro has recently appeared on Fox several times where he has argued that ‘Muslim patrols’ were a growing security concern for the United States, discussed the possibility of an anti-American alliance in the Middle East with Syrian Jihadists, and hyped fears that Somali refugees in the United States were becoming ‘homegrown’ terrorists. The construction of the building blocks for similar Muslim enclaves and “no-go zones” in the U.S. is one of the most disturbing programs of Islamist groups. If successful, these territories will be the first to establish Shari’a law in the country, thus offering a profound challenge to America’s constitutional order. Other board members from the Clarion Project who have also made their way onto Fox include Frank Gaffney, one of America’s most notorious Islamophobes and Fox’s go-to anti-Muslim activist, Zuhdi Jasser. Gaffney has used funding for his Center for Security Policy to produce reports promoting the baseless myth that Muslims are conspiring to implement Sharia law in the United States. What about the representatives of CAIR and that muhammadan anchor with CNN? What are they, if not the trumpet section of the islamists? Well of course this is not about religion but about robbery. It’s not like Christians are natural enemies of Islam. Those Christains who help Muslims now are just doing what the Messiah (peace be upon him) said is the right thing to do. Who thinks that it is a good Christian deed to murder Muslims, or vice versa, that it is worthy for Muslims to murder Christians is of the devil. After all it is written that God crerated man as different tribes so that they may learn to respect each other. attacks, perpetrated by a pro-Christian militia. sheltering more than 500 Muslims, providing food, water and medicine. Community, to live with him in the church compound. mission” with warfare and killings.